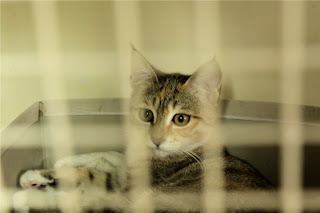 We had our FOURTH stay of 2012 in the cat hotel last week! Can you believe it, how lucky are we! We got a garden view again, and this time we could see chickens AND sheep. The reason we were in the cat hotel was that Rachel and Pete were on ANOTHER holiday. This time they went to Rome, which sounds a bit of a faff really. Rachel was pretty happy though, as on the first day of their holiday they came across some cats. (Well, she says they "just happened" to come across them; Pete says she had it all planned out before they even left the UK - I think we know who to believe!). The cats live in a square called Torre Argentina which is a site of various ancient Roman temples, and also apparently where Juli-puss Caesar was stabbed. Ooh! Now it's mostly a ruin of great archaeological importance, but you can't go into the square to walk around... UNLESS you are a cat! There is a no-kill cat sanctuary there run by some very lovely ladies - you can see their website here. When people in Rome find a poorly or stray cat, they often bring them to this sanctuary, where they are treated, sterilised, and then either adopted out or allowed to live amongst the ruins for the rest of their life. How cool is that! There are a LOT of cats in Rome; Rachel and Pete saw them in the Coliseum and lots of the other places they visited. The nice ladies at the sanctuary were very happy to show Rachel and Pete around the quarantine area - where new cats stay for a while. They learned all about the work the sanctuary does and met lots of the residents. This little cat was hilarious - Pete squatted down to look in a cage and the kitty jumped up onto his back! Nice work. He's sitting in Rachel's hat here, which she put down on the floor for convenience. We're very happy to see that the idea of sitting in something which is clearly FAR too small for you has spread even amongst the street cats of southern Europe. These guys were just hanging out. Rachel said she was really impressed with how well all the cats got along, considering sometimes we can't even be friends, HMPH. This little guy was hanging out in a cage with his brothers, while the vets worked out if they had any nasty diseases. Look at those ear tufts!! Sleepy time! The ladies at the sanctuary said that some of the cats in this part were going abroad to be adopted - one was going to Germany. This cat had a poorly eye, like quite a lot of the cats there. But they all seemed very happy! Outside, all the cats have the tip of their ear missing, it's a sign that they've been sterilised, so no-one catches them and tries to do it again! This little calico lady was watching the cats in the "hospital" area - these were sanctuary cats who had strayed outside the ruins and been knocked by a car. Poor things - there are a LOT of cars in Rome; and the ruin is essentially a sunken roundabout with roads on all sides! This cat reminds me of Bertrum Thumbcat from the Cravendale ads! Can you spot (at least) three cats in this next photo? These cats really do have a huge playground to call home. It's quite amazing. This was Rachel's favourite cat from outside. Such a lovely big chap (or chapess!). And so photogenic! Do you want a British penpal, Ginger?! So, if you ever visit Rome, we strongly recommend you visit the cat sanctuary at Largo di Torre Argentina. It's very central, a nice break from the hubbub of the city, and will definitely help if you're missing your kitty cats while on holiday! !